BROWNSBURG, Ind. 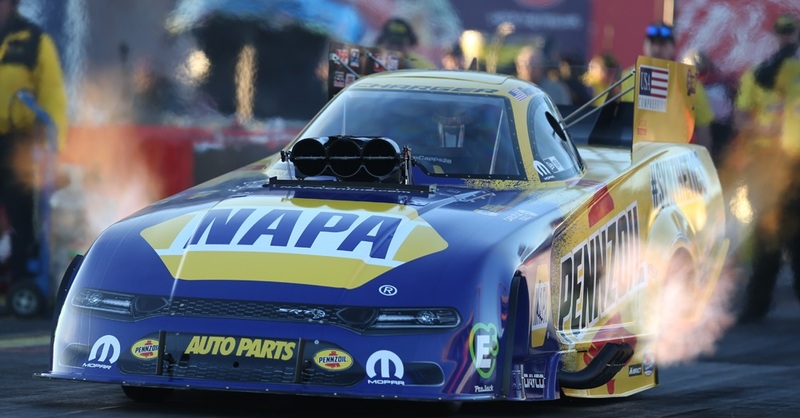 (May 13, 2014) – Ron Capps’ relationship with NAPA AUTO PARTS began in 2008 at Don Schumacher Racing and since then each year he has competed in the NHRA Southern Nationals at Atlanta Dragway in Commerce, Ga., he wants to have a long day of racing on Sunday. Of course his goal at every event on the NHRA Mello Yello Drag Racing Series circuit is to be racing in the championship round of eliminations, but the Atlanta event carries extra luster. 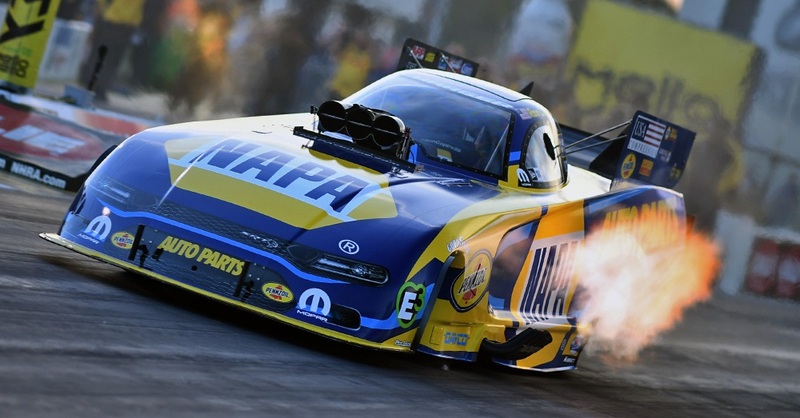 Ron has won 13 of his 41 NHRA event titles with NAPA AUTO PARTS on his Dodge Charger R/T Funny Car, and none was bigger than in 2012 when he won in the backyard of Atlanta-based NAPA AUTO PARTS. 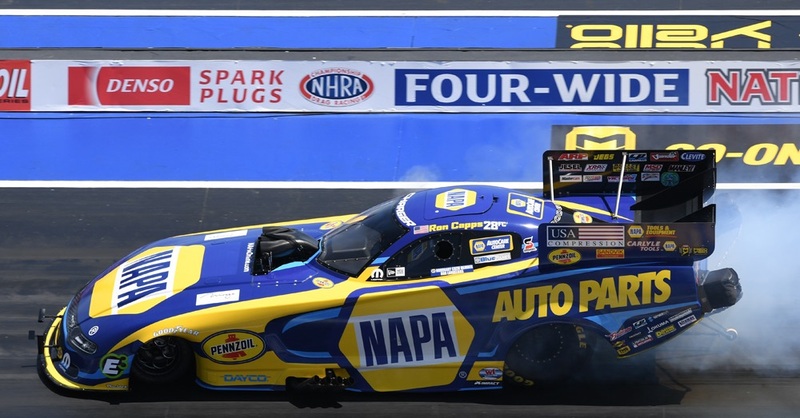 NAPA’s headquarters is about 70 miles southwest of the Commerce track and there is nothing better for Ron than to celebrate winning an NHRA Wally trophy with your sponsor and family. The 2012 Atlanta title was the first for Ron since team owner Don Schumacher paired him with three-time world championship crew chief Rahn Tobler four races into the season. 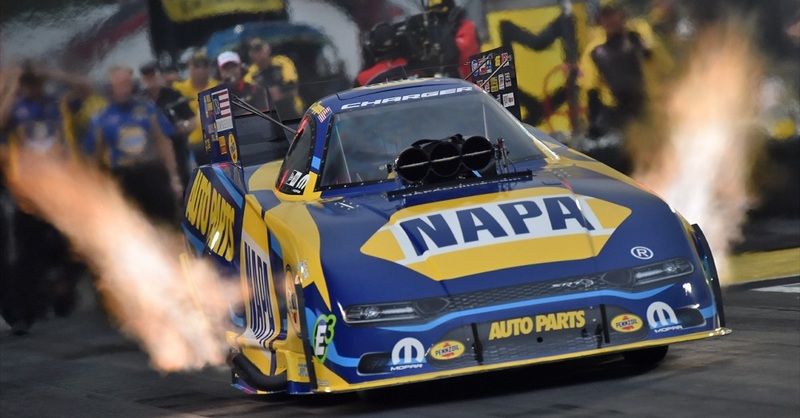 “I’d been to the final round there four times and it couldn’t have meant more to finally win there for NAPA AUTO PARTS and to do it with Tobler,” Ron said. One of the guests in the winner’s circle was Mike Rearden, who oversees the NAPA AUTO PARTS motorsports program. A title in the 2014 Southern Nationals, which begins with qualifying Friday and Saturday leading to Sunday’s eliminations for the top-16 qualifiers, would bring back even more special memories. Atlanta is where Ron advanced to his first of 82 final rounds in 1995 while a rookie driving the Top Fuel dragster owned by Roger Primm. The race near Atlanta is the first of three in three weeks for the Mello Yello series. From Commerce, Ga., the series moves to Topeka, Kan., and Englishtown, N.J. It’s the first of three segments on the 24-event schedule with three or four events on successive weekends. 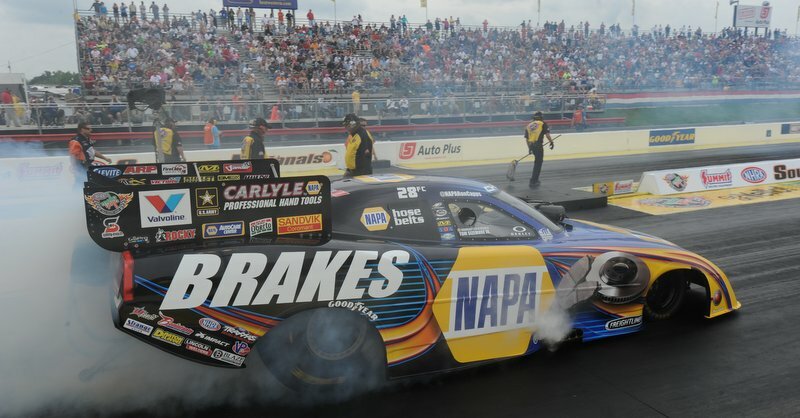 Featured image: At Commerce in 2013, Capps performs a burnout in the NAPA Dodge Charger R/T Funny Car wearing a special NAPA Brakes paint scheme. Summer Emergency Car Kit: What's in Yours?